This is the week that Disneyland and Walt Disney World kick off "Get Your Ears On – A Mickey and Minnie Celebration." At Disneyland, the promotion centers around Mickey's Mix Magic, a new nighttime show that debuts this Friday, January 18. Next week, Mickey's Soundsational Parade returns to Disneyland on January 25th. 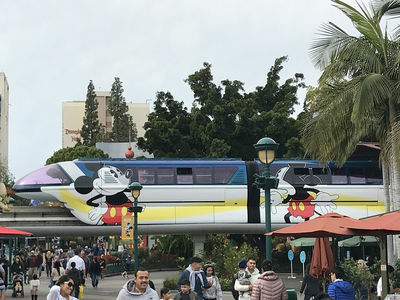 Monorail Blue has a new look for the Get Your Ears On celebration. Photo by Adrienne Vincent-Phoenix. Souvenirs are a strong focus of this 90th anniversary celebration, and Disney's shops are absolutely packed with Mickey and Minnie merchandise for everyone, right down to the family pet. 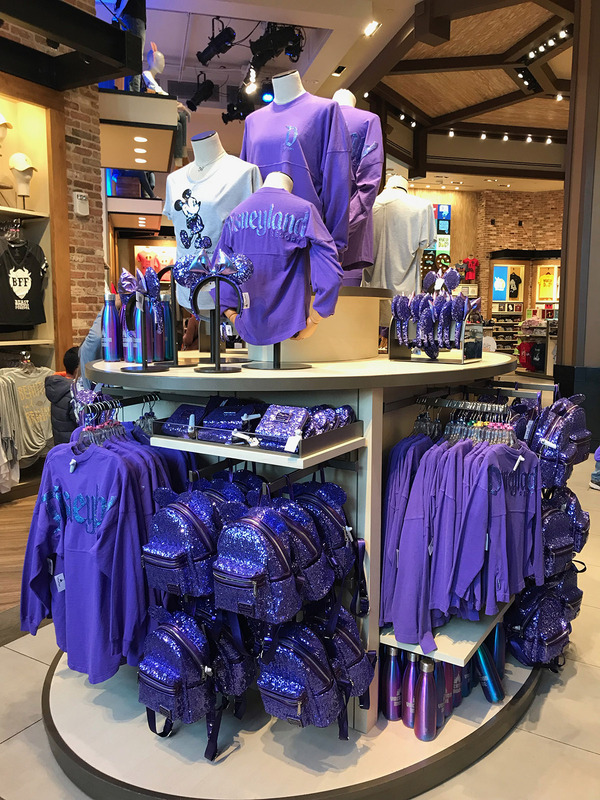 Rose Gold is so 2018—Disney's new trendy color is Purple Potion, and it's available on everything from headbands and backpacks to water bottles and cake pops. Photo by Adrienne Vincent-Phoenix. 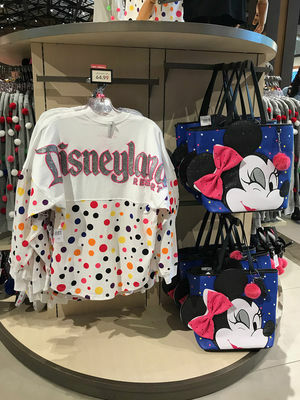 The Rock the Dots collection is devoted to Minnie Mouse, and features this new Spirit Jersey that many fans have compared to the Wonder Bread bag. Photo by Adrienne Vincent-Phoenix. 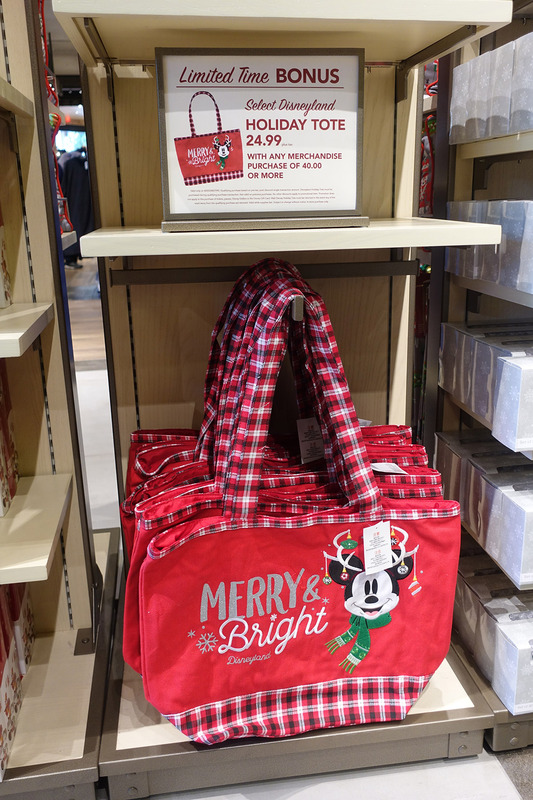 We don't really know much about Mickey's Mix Magic. Disney has said it's led by "DJ Mickey," and runs about 10 minutes long. From the one piece of concept art released by Disney, it appears the show relies heavily on the projectors installed along Main Street, U.S.A. and used in recent fireworks shows. Additional projection sites include the facade of "it's a small world," and the Rivers of America water screens used for Fantasmic. Sleeping Beauty Castle, used as a fourth projection site during past nighttime shows, is not mentioned as part of Mickey's Mix Magic, likely because the Castle is currently closed for refurbishment. 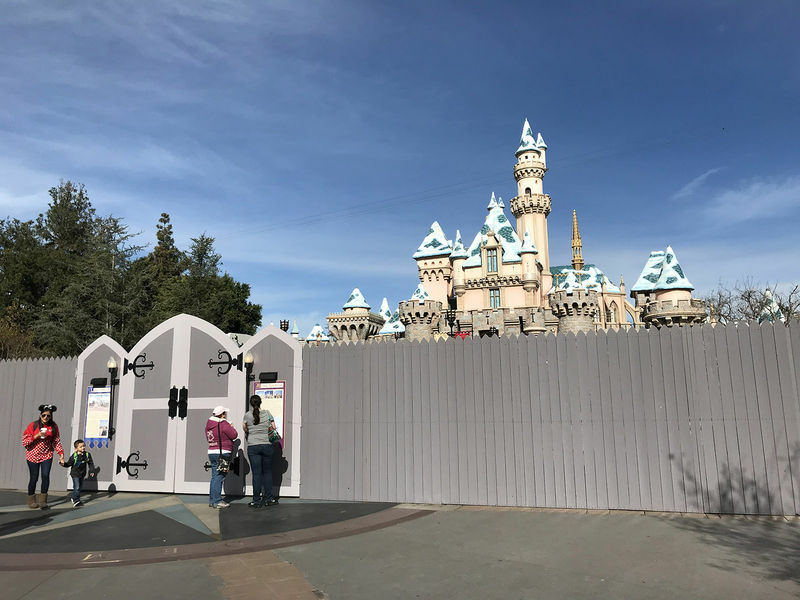 Sleeping Beauty Castle is closed for refurbishment, and will likely not be used in Mickey's Mix Magic's debut season. Photo by Adrienne Vincent-Phoenix. The first public performance of Mickey's Mix Magic is at 9:30 p.m., immediately following the 9:00 p.m. Fantasmic. This gives folks with Fastpass to the first Fantasmic an advantage, as they will likely be allowed to remain in place to watch Mickey's Mix Magic. Disney's description of the show says that "fantastical fireworks will add a pinch more pixie dust to the occasion on select nights," but the daily entertainment calendar does not provide any details about which performances will or will not include fireworks. Our guess is that the 9:30 p.m. shows on Friday, Saturday and Sunday nights will likely include the pyrotechnics, where the 7:30 p.m. and 8:30 p.m. performances on weeknights might not. We hope to get additional information from Disney about the schedule this week. Disneyland attendance may see a slight increase over projections this week due to a planned strike by teachers of the Los Angeles Unified School District. 34,000 teachers will walk out Monday morning, affecting nearly a half-million students in the district. While the LAUSD plans to keep school campuses open, and says students are still expected to attend school during the strike, it's possible that some parents will opt to keep their students away from school until teachers return. We don't expect the strike to make a noticeable difference on Disneyland's crowds, but thought it was worth noting for those planning a visit this week. None of Disneyland's annual passports are blocked out this Monday through Friday, and both the Limited-Time Special Ticket Offer ticket and the Limited-Time Southern California Resident ticket are valid this week. Ballast Point officially opens the doors to the restaurant and brewery in Downtown Disney this Wednesday, January 16, though the restaurant hosted a weekend of "soft opening" previews over the weekend. 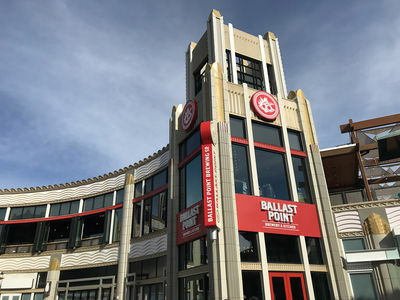 Ballast Point debuts this week in Downtown Disney. Photo by Adrienne Vincent-Phoenix. A year in the making, the new restaurant offers a on-site brewery and dining room, with both indoor and outdoor seating. The restaurant is located on the upper floor of the building previously shared by Ridemakerz and Build-a-Bear Workshop. The menu is an interesting mix of appetizers, salads, flat breads, sandwiches and entrées, with prices comparable to the chain's other US locations. Kids meals are a flat $10, with the standard chicken tenders and cheeseburgers supplemented by fried fish and a gluten-free quesadilla. Our Todd Pickering will be at the grand opening on Wednesday, and will share his thoughts on the new eatery with us—be sure to follow MousePlanet's Instagram and Twitter accounts for his take. ...Disneyland is working on the sidewalks along Main Street, U.S.A., with temporary work walls up in two locations. A section of the walkway in front of City Hall is closed for construction. Photo by Adrienne Vincent-Phoenix. ...Rancho del Zocalo Restaurant at Disneyland is closed this Monday through Thursday for a brief refurbishment. ...Disneyland's Haunted Mansion is scheduled to reopen this Friday, January 18. The Astro Orbitor is closed for refurbishment. Photo by Adrienne Vincent-Phoenix. ...The Sleeping Beauty Castle Walkthrough closes this Thursday, January 17, due to the castle renovation project. ...This is the final week to ride "it's a small world" Holiday, before the attraction closes on Tuesday, January 22 to remove the holiday overlay. Haunted Mansion Holiday – closes January 7–17 to remove holiday overlay. 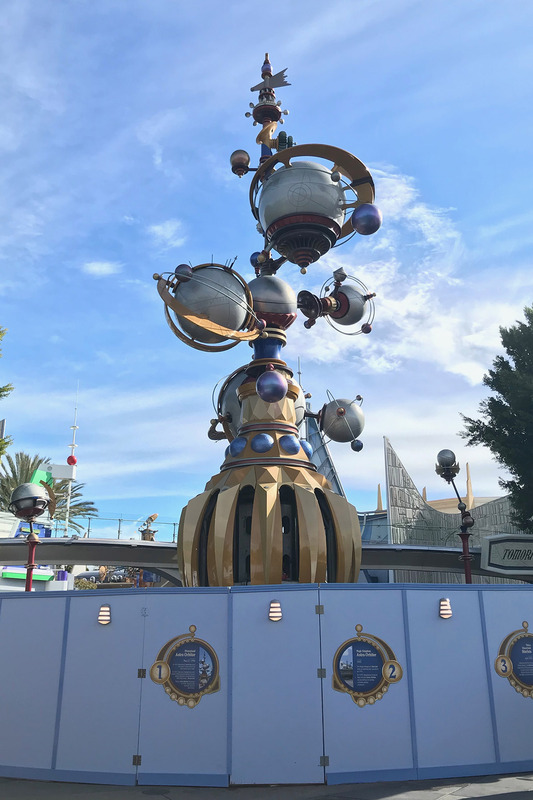 Astro Orbitor – closes January 7 for refurbishment. No reopening date announced, but after February 8. Rancho del Zocalo Restaurant – closes January 14–17 for refurbishment. 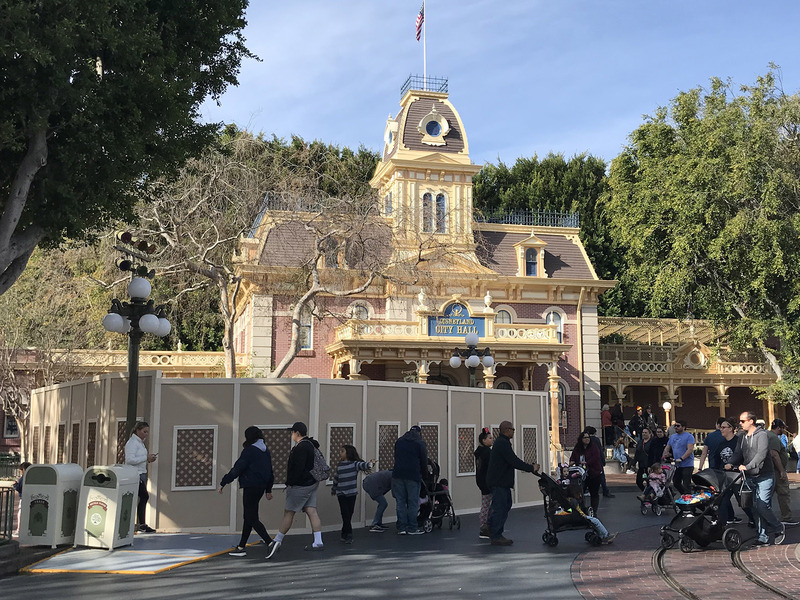 Sleeping Beauty Castle Walkthrough – closes January 17 for refurbishment. No reopening date announced, but after February 8. "it's a small world" – closes January 22 - 31 to remove the holiday overlay. Sailing Ship Columbia – closes January 22 for refurbishment. No reopening date announced, but after February 8. Splash Mountain – closes February 4 for refurbishment. No reopening date announced, but after February 8. Grizzly River Run – closes January 7 for refurbishment. No reopening date announced, but after February 8.